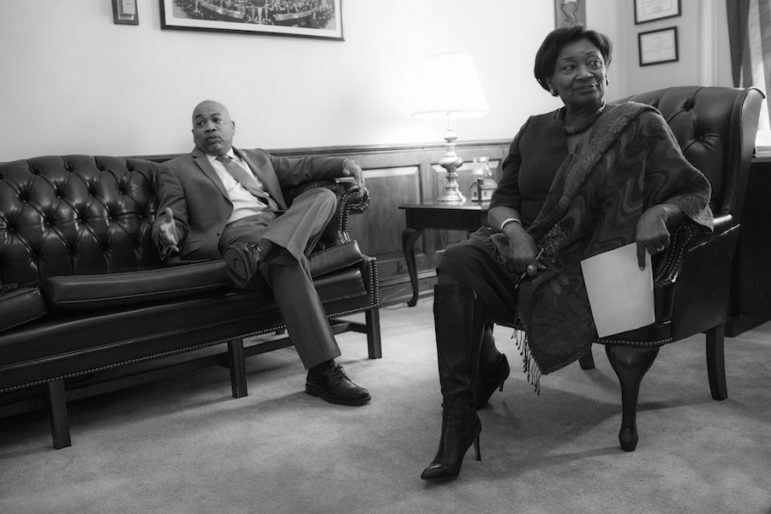 Assembly Speaker Carl Heastie and Senate Majority Leader Andrea Stewart-Cousins lead Democratic delegations that face high expectations from tenant groups this spring. In 1993, New York State fundamentally reset the balance of power between tenants and landlords in New York City with a set of changes to rent regulations that firmly favored building owners—moves that the legislature deepened four years later. More than 160,000 apartments are believed to have fallen out of regulation since 1994 thanks to those changes. In 2019, with the first solidly Democratic state Senate in a half century, tenant advocates could be on the verge of a dramatic swing in the other direction. McKee said he feels vacancy decontrol—which de-regulates apartments once their rent crosses a threshold—will almost certainly be repealed. He is confident also that preferential rent will be reformed to permit increases only upon vacancy, meaning that a landlord cannot suddenly hike an existing tenant’s rent from a discounted level to the legal level. Efforts to alter the way major capital improvements or individual apartment improvements are factored into tenants’ rent face a tougher fight, he says. The more ambitious goals for McKee and his allies are retroactively re-regulating apartments—which he says is politically possible—and establishing “universal rent control,” which would apply the rent laws that now affect only eight counties (the city, Nassau, Rockland and Westchester) statewide. I think a really big lift and the more important part of this fight is we have a unique opportunity to expand rent regulation and tenant protections statewide. There are tenants groups in all parts of the state organizing for rent control, as indeed there are in other states across the country. This is a very exciting development. We’ve never seen this before. And it’s a reflection of the fact that the situation has gotten really bad for people who rent. And half of NYers rent and a substantial number of them, are rent-burdened. We calculate there are like a million tenants outside NYC in the suburban counties who have zero protections at the moment. Ricci, whose organization has joined with the Real Estate Board of New York and other real-estate interests in a coalition calling for “responsible rent reforms that protect tenants, but also small property owners who are already struggling to maintain their buildings,” said they will push lawmakers to give more consideration to landlord operating costs. Certainly people in coops and condos understand this because they have to pay their yearly maintenance. They get a breakdown of how their costs have risen dramatically over the past 10 to 20 years. And for rental building owners, it’s no different. I lay this squarely at feet of Mayor Bloomberg, who raised taxes in a way that no other mayor had ever done before him. He had this unprecedented mid-year tax rate increase, not once but twice, and then assessments were through the roof. So taxes, and I’m including water and sewer rates in that because that’s gone up astronomically, have taken a much bigger bite out of owner income. Some of that’s been passed on to tenants – they’ve been insulated because of the political nature of the rent guidelines so they haven’t paid the full ride on that. But it’s certainly has put a lot of pressure on landlords to maintain an income stream of a building so they can maintain the building and make a profit. We’re hoping to have more of a debate on what owners face when it comes to the expense on a daily basis. Ricci said legislators should remember that tenants are not the only ones affected by changes to the rent laws. Landlords, of course, are impacted. But so are the contractors who do repair work. “At the end of pipeline, the people who are gonna get hurt are the people who do the work in those apartments. There are tens of thousands of people every day who are renovating apartments, People who do tile work, demolition, carpenters, electricians, plumbers,” he said. Rent stabilization affects 966,000 apartments in New York City and some 2 million tenants here. A much smaller system of rent controlled units built before 1947 has rent changes governed by a state agency. The tenant groups’ hopes this Spring rest not just on the numbers in the State Senate but the names who are there—rookie senators like Zellnor Myrie, Alessandra Biaggi, Jessica Ramos and others whose pledges strengthen rent laws were centerpieces of their successful campaigns against incumbent Democrats in 2018. Listen to the interviews below or hear our full show, where we also break down the big state budget deal. Max & Murphy is transcribed by David Bogoslaw. i live in a rent-controlled unit. my rent goes up 7.5% every year. there is no discussion about those in my position though. why is that?